Book Character Skirt. Made with Dr. Seuss Fabric. I really do not know about the product because I have not received it. I ordered on March 2 and was told it would "definitely" arrive on time with regular shipping. I understand things happen but it is what happened when I did have issues. I contacted them letting them know the issue and the fact that I needed it on Sunday and still had not arrived. I had ordered from many other etsy shops on the same day and everything arrived on time and early. I felt her response was a bit defensive and at one point she stated it was (and she put in all caps) NOT their problem. I responded back basically stating the response seemed rather salty and defensive and then it got ugly with and email starting with "Man, in all due respect...followed up with a nasty email with many capitalized words and ???. I wish had more room to write more! Amazing service! Great seller! Thanks!!! 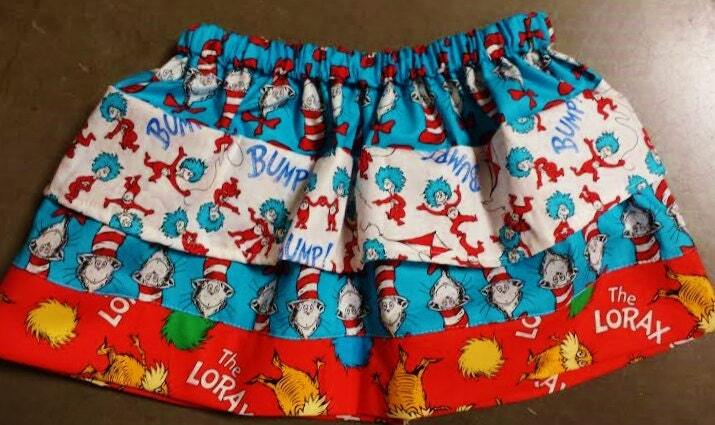 Cutest Dr. Seuss skirt ever! Arrived quickly! This skirt was perfect for my daughter's Dr. Seuss party. She received so many compliments from our guests. I would definitely purchase from GraceMadison again. This skirt is even better in person. My daughter wore it to school for Dr Seuss week and we received so many compliments. People were stopping us to ask where we got it. This seller is so helpful. She made this a vert pleasant transaction. I would definitely use her again.